I turned vegan in June and it's very challenging, so I know how hard it is. Especially when you're cooking meat for the family. My favourite thing to eat is a wrap filled with pepper, cucumber, celery, whatever you like and dollops of houmous, guacamole or salsa. No vegan here - I had a yummy burger the other night and loved every greasy drop. I read that this is actually Rounded Pi Day - this year only! Since the number is 3.14159 etc., if you round that you get 3.1416. But as I'm writing this the day is already finished in Britain. Only a century to wait for the next one. I can't help on the veggie/vegan front, but that Boxing Day pie sounds delicious! I love a good pie. I'm a disgrace for someone living north (of London) as I don't like pies! 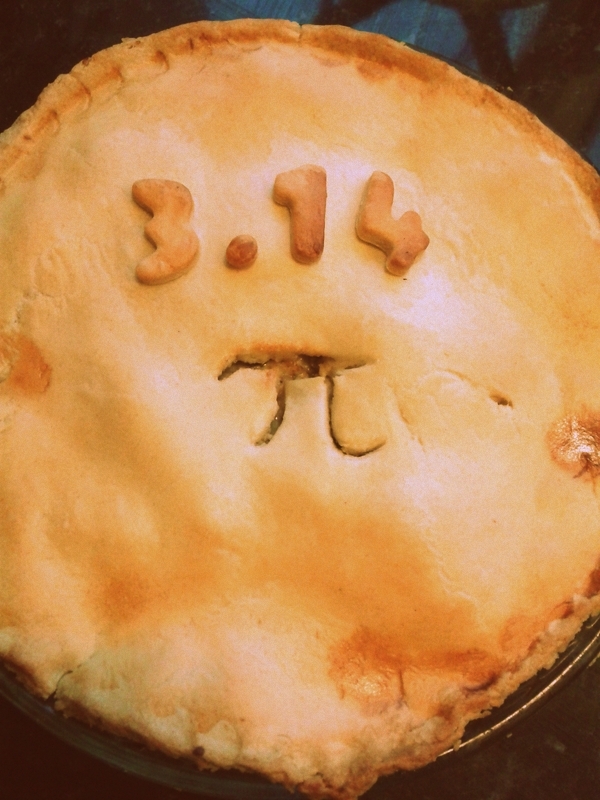 For me, Pi Day was always a great excuse to eat pie in math class, but has gone relatively unobserved since then. By coincidence, I whipped up a quick quiche (egg pie here in the south) on Monday with, much like your Boxing Day pie, every leftover in the refrigerator. Certainly not vegan but delicious anyhow. Good on you for honoring Boy1's request! I had no idea that the Pi Day phenomenon was just an American thing. I have never heard of pie day but my that does look delicious! Having recently turned veggie myself in November, I do admire your resolve, a friend was eating a Gregg's sausage roll near me the other day and it was the biggest test of my will power so far, not to grab it and run off stuffing it in to my face. I am hopeless at cooking so have no recipes to offer but can say the frozen Quorn pies are actually quite nice when the stodge cravings call! Meat, veg or apple, I just love a pie. Slice or whole!!! Impress your son with the fact that British Pi Day is 22nd July (22/7). So you have another chance to celebrate! My favourite pie is Lemon Meringue Pie. Or apple pie with ice-cream if you want me to choose a covered pie. Although I prefer apple crumble and custard! I was addicted to custard during my first pregnancy. You made me snort tea! Hahahahahahha!! "For those not in the know, today is also apparently 'Steak and BJ day', or Valentines for men - one month on. Unhappily for Mr FHCS of course, no meat crosses my lips these days...)"